As of 1st May 2015, Facebook implemented changes to their policy which relate to how Apps like GigaTools can post on your behalf to your Facebook profile and pages. In the past, GigaTools could post a short message to your Facebook profile or pages regarding any Gigs you had that day, as well as a message announcing any new Gigs you had added to your schedule. 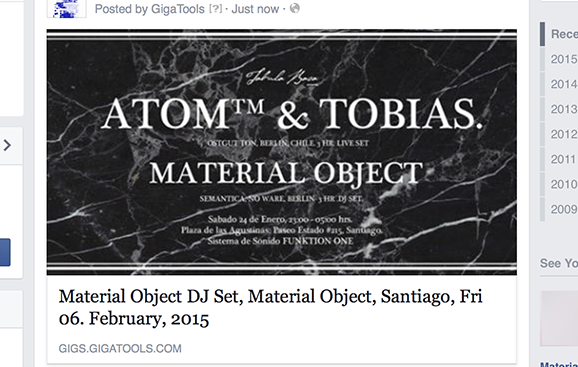 Now, instead of posting a message regarding a specific Gig, GigaTools will post a link. The link GigaTools posts will be either the link you added when you first created the Gig to your schedule or a link to the Gig on the public GigaTools Gigs Listing site. When announcing New Gigs, GigaTools will also post a link to your complete Gigs listing Page on the public GigaTools Gigs Listing site, rather than the short announcement you would have seen before May 1st. To take advantage of these new features, please reconnect your GigaTools User or Group to a Facebook Profile. This entry was posted on Monday, May 4th, 2015 at 1:19 pm and is filed under Help, News. You can follow any responses to this entry through the RSS 2.0 feed. Both comments and pings are currently closed.